That’s no joke! Cases have been diagnosed in all 50 states4—so it’s important to protect your dog no matter where you live. How do dogs get infected? The short answer: mosquitoes. A single bite from an infected mosquito can put your dog at risk for developing heartworm disease. A mosquito bites an infected animal and takes in young heartworms as it feeds. Heartworms grow in the mosquito and become infective. When an infected mosquito bites another dog, the heartworms enter through the bite wound. Inside the dog, heartworms grow into adults that live in the major vessels around the heart and, in severe cases, the heart itself. Within seven months, adult female heartworms release young heartworms into the dog’s bloodstream. 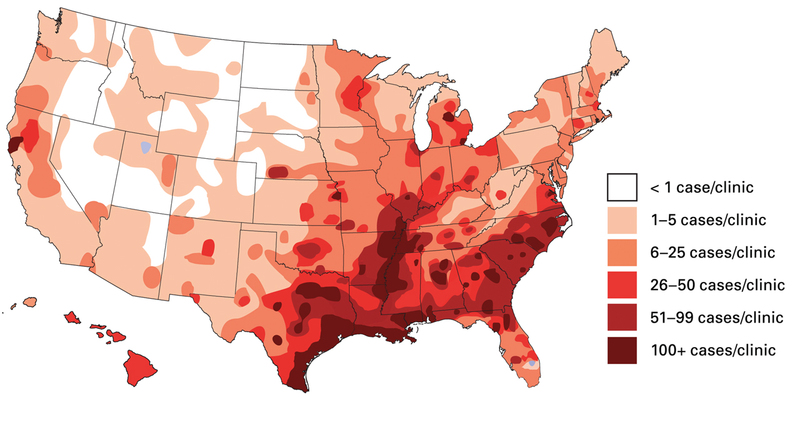 The severity of heartworm incidence as shown in this map is based on the average number of cases per reporting clinic. Some remote regions of the United States lack veterinary clinics, therefore we have no reported cases from these areas. Heartworm disease: symptoms and treatment. See the ProHeart 6 difference. IMPORTANT SAFETY INFORMATION: PROHEART 6 should be used in healthy dogs. Do not administer to sick, debilitated, underweight dogs or dogs that have a history of weight loss. Prior to administration, PROHEART 6 certified veterinarians should continue to assess patient health through a medical history, physical examination and if deemed appropriate, diagnostic testing. Continue to use caution when administering PROHEART 6 concurrently with vaccinations. Adverse events, including anaphylaxis, have been reported following the concomitant use of PROHEART 6 and vaccines. In some cases, anaphylactic reactions have resulted in death. Use with caution in dogs with pre-existing or uncontrolled allergic disease (food allergy, atopy or flea allergy dermatitis). Dogs receiving PROHEART 6 should be tested for existing heartworms as per the product label. In people, avoid PROHEART 6 contact with eyes. If contact with the eyes occurs, rinse thoroughly with water for 15 minutes and seek medical attention immediately. PROHEART 6 is available only to veterinarians through a restricted distribution program. Only certified veterinarians and staff can administer it. See full Prescribing Information. IMPORTANT SAFETY INFORMATION: Simparica is for use only in dogs, 6 months of age and older. Simparica may cause abnormal neurologic signs such as tremors, unsteadiness, and/or seizures. Simparica has not been evaluated in dogs that are pregnant, breeding, or lactating. Simparica has been safely used in dogs treated with commonly prescribed vaccines, parasiticides, and other medications. The most frequently reported adverse reactions were vomiting and diarrhea. See full Prescribing Information. Zoetis Data on file. ProHeart 6 Freedom of Information Summary, NADA 141-189. Zoetis Data on file. 2015 Global Pharmacovigilance Summary. Vetstreet Report. Sept 2016. Zoetis Data on file. Current canine guidelines for the prevention, diagnosis, and management of heartworm (Dirofilaria immitis) infection in dogs. American Heartworm Society. https://www.heartwormsociety.org/images/pdf/2014-AHS-Canine-Guidelines.pdf. Accessed March 30, 2017. Pet owner resources: heartworm basics. American Heartworm Society. https://www.heartwormsociety.org/pet-owner-resources/heartworm-basics. Accessed March 3, 2017.